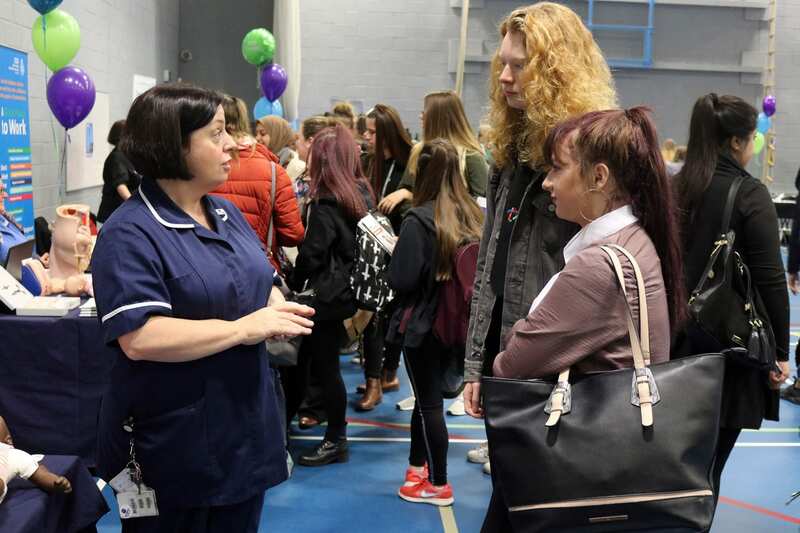 Over 900 high school, academy, college and sixth form students from across East Lancashire attended an NHS careers fair providing an opportunity to gain information on both clinical and non-clinical careers including IT, engineering and marketing. Organised by the Work Based Education Team at East Lancashire Hospitals NHS Trust, the Sports Hall at Nelson and Colne College hosted the 10-hour event at which ELHT showcased a variety of exciting career opportunities. Also in attendance were several higher education providers including the University of Central Lancashire and local colleges who were able to advise on the ‘next steps’. Sufiya Rasul, Widening Access and Apprenticeship Lead for East Lancashire Hospitals NHS Trust, said: “We are delighted to report that the careers fair this year was a huge success. Thank you to Nelson and Colne College for hosting the event and well done to the many schools and college for giving their students the opportunity to learn more about a career in health and social care. Schools and colleges from Darwen all the way across to Pendle attended the event, which will be followed by further events in 2019 as the NHS in East Lancashire continues to be the employer of choice for local young people. Alison Rushton, Vice Principal of Nelson and Colne College, said: “This really was a fantastic chance for young people and adults right across the East Lancashire area to discover the range of careers available within the NHS and the qualifications needed to reach these positions. I’m delighted that so many took up that opportunity to find out more. “As an institution with a career college ethos, it was a great pleasure to be able to host this event. We have a commitment to developing a talent pool of work ready students for organisations including the NHS, who we work very closely with on a number of fronts including Nursing Cadets and a ground-breaking work experience programme which has secured around 500 clinical and non-clinical placements in the Trust this year for College students across East Lancashire.